Nick Hornby understands passionate fans of rock music and the people who create it. His novel High Fidelity and the film starring John Cusack are classics. He also wrote About a Boy, the story of a man who, years after his father’s one novelty hit, is living off the royalties and not doing much else. It became a beloved film starring Hugh Grant and television series. 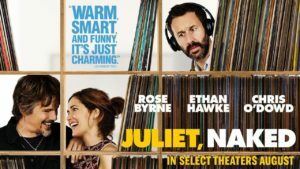 He brought those two ideas together in Juliet, Naked, the story of a passionate fan and a faded rock star who are connected by the woman they both love. Annie (Rose Byrne) cannot quite figure out how she got where she is and is even less able to figure out how to get anywhere else. When her parents died, she took over her father’s job as curator of a small history museum and raised her younger sister, who now works there with her. 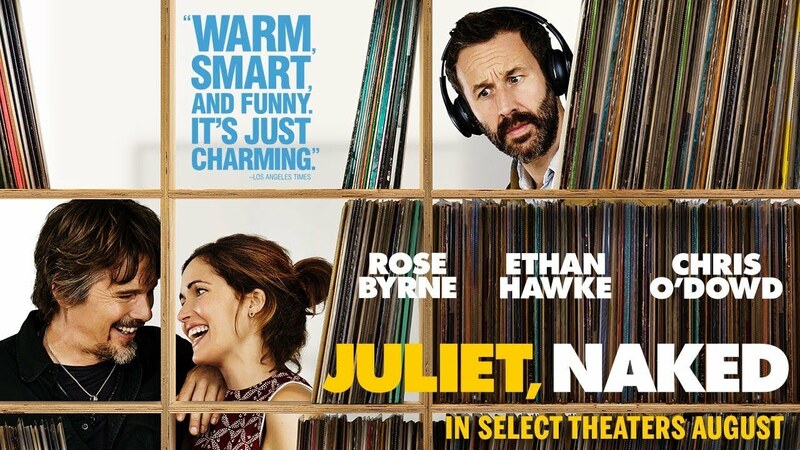 She has been living with Duncan (Chris O’Dowd), her boyfriend of 15 years, a professor of popular culture who shows his students clips from “The Wire” and who operates a fan site for the elusive Tucker Crowe, a rock star whose disappearance has only increased the interest in his one classic album, called “Juliet” and inspired by a break-up. Duncan receives some previously unreleased Crowe songs, the original demos of “Juliet,” “naked” because they have no studio sweetening or instruments other than Crowe’s guitar. For a fan who obsessively collects Crowe arcana, this is the ultimate treasure. Annie, irritated with him for his fixation on a musician who has not released any new music in decades, writes a bad review of the new tracks on Duncan’s fan site, calling it a cash grab, and she gets an email from Crowe himself, agreeing with her. This leads to an email correspondence, “You’ve Got Mail”-style. And then to a meeting IRL. The movie was directed by a real-life rock star, Jesse Peretz of The Lemonheads, and he has a feel for the life of a rock star and the life of a fan. He (and Hornby) have less of a feel for Byrne’s character, and even Byrne’s endless charm and skill cannot make up for an underwritten role. Hawke does better. Crowe is so shaggily rueful about his own failings as a performer, a person, and a father that we almost forget just how irresponsible he has been. It’s a slight story, but it’s a sweet one. Parents should know that this film has very strong language, sexual references and non-explicit situations, references to alcoholism and drug abuse, references to irresponsible behavior, and a medical issue. Family discussion: What makes some people into super-dedicated fans? Was Annie right about the museum exhibit?